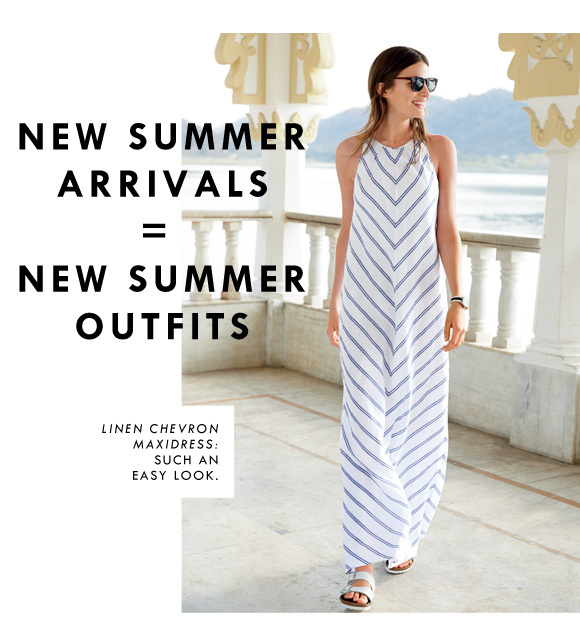 This Calvin Klein maxi I picked up last summer features a ruched side with medium-wide modern stripe and simple scoop neck. Apparently I wasn’t the only one who thought so because I continue to see it everywhere. Everywhere. Downtown, nights on the town, church–even at an upscale event (note to self: wear sparingly this year). I also picked up one very similar to this Calvin Klein maxi. The diagonal stripes add to the fluidity of the look as does the varying widths and colors of the stripes. All necklines are not created equal. V-necks tend to elongate and are a friend to all, especially the vertically challenged. If your shoulders are your favorite assent, embrace spaghetti straps; if not, look for scoop necklines, v-necks or halters. “Voluminous” should only be used as a shampoo adjective. Too much fabric is easy to get lost in. Shorty get low. Long lengths equal lean illusions. A maxi’s hem is supposed to hit right around the ankle, unless your maxi has a mullet hemline (short in the front, long in the back), a look I just don’t think works in most cases, except Teen Vogue fashion editorials. Less is more. Pair with a great pair of flats or small wedges. Save your sky high heels for a skirt or skinny jean/capri. Show a little skin. If you’re so bold, the newest maxis to debut this season feature cut-outs (mostly at the waist). As this is likely to accentuate your leanest point, work it. Be bold. Bright colors, whimsical patterns and color blocks are (typically) your friend. Work it. Before you take the plunge, try the maxi on before you buy. Each one fits differently, and ultimately it may not be a trend you choose to embrace. Entry filed under: Uncategorized. 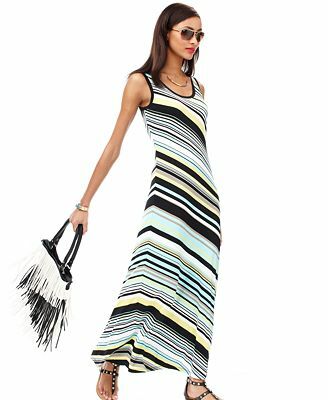 Tags: bcbg Max Azria maxi dress, calvin klein maxi dress, calvin klein ruched maxi dress, calvin kline striped maxi dress, celebrity maxi dress, flattering maxi dress, how to wear maxi dress, maxi dress, maxi dress styling tips, maxi dress trend, Newport ri, Newport ri boutiques, newport ri fashion, Newport RI stores, Newport ri style. I can’t do the maxi- it’s not for wide hips and a little waist, but I’m hoping to embrace the maternity dresses this summer leaving all caution in the wind!